When you think of “wine country”, for most people, pictures of lush Sonoma hillsides and leisurely meals at a vineyard pop to mind. Perhaps images of the more glamorous Napa spring to life, with its mix of Michelin star cuisine and limo chauffeured tastings through the winding vineyard trails. Classic, right? But both of those images conjure one thing: California. What’s an East Coast oenophile to do if they don’t want to hop a plane and go 3000 miles? Visit one of these unexpected East Coast wine regions, that’s what! If you can plan to drive against Hamptons-bound traffic, hop the Jitney, or catch a Long Island Rail Road train, this one is the most convenient for New Yorkers. When I think of Long Island, I haven’t thought of wine. However, according to the official website of the Long Island Wine Council (www.liwines.com), the North Fork is home to about 60 vineyards. Looking at a Google map image of the area, I believe it! I literally lost count of the ones listed. Upstate New York and wine? Who knew! (Well, I did, but that’s because I live in NYC and love wine. But, I digress…) This particular trail boasts about 15 wineries. If you’re in the NYC area, plan a fun day trip or a long weekend in any of the bucolic towns this trail cuts through – rent a car and go north about 60 miles! Farm stands and antique shops abound, with plenty orchards and ice cream stops to make along the way. Bonus tip: there are several drive-in movies not far from the wine trail. Wind your way through the tastings and then have your designated driver pull up to a big outdoor screen near you! I definitely don’t think “wine” when I think “Poconos”. I actually start singing (and you do too if you grew up in the surrounding northeastern states) “…byooo-tee-full Mount Airrrrr-eee Lodge!” (Did you sing it as you read it? You’re welcome.) But lo and behold, there is indeed wine country in the Poconos! 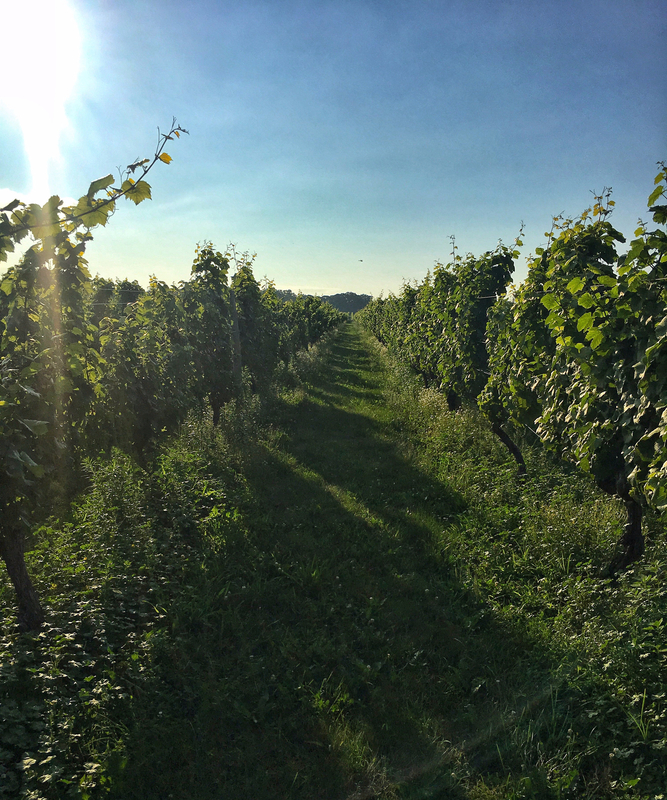 The Pocono Wine Trail is home to about 8 vineyards, all relatively close to each other. It’s very possible to make a full day of it and visit them all, but more fun to make it a weekend. Year round activities in the area include zip lining, hiking, and (of course…) shopping. As if the Blue Ridge Mountains weren’t beautiful enough, there’s wine in them there hills! (I’m so sorry. I couldn’t resist that last bit… I’ll show myself out right after this paragraph. No, I won’t.) The Monticello Wine Trail is definitely too big to cover in one day, with about 30 wineries on the route. But you’ll want to slow down and stay a while to enjoy the mountain views and take in the history of the area. From the website, “the wineries on the Monticello Wine Trail have all been inspired by Thomas Jefferson’s vision of grape growing and winemaking.” It’s a nerdy oenophile’s dream come true! So what are you waiting for? Gas up the car or get a train ticket and go walk among the vines while sipping a glass of vino! You’ll be a world away from everything, and you won’t have to fly 3000 miles to get there.